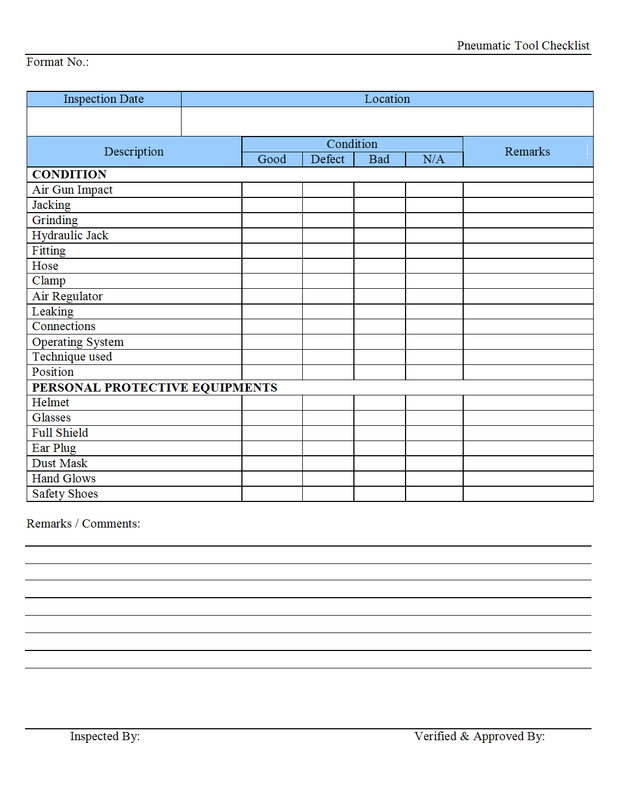 Pneumatic tool checklist is maintenance related checklist document. It may help to ensure that the each part of the pneumatic tool is properly maintained, and its functioning well. Designate a competent person responsible to do inspections at the prescribed intervals. Inspect items at prescribed intervals or more frequently as may be necessary if conditions have changed. If an item is in order, mark the YES column. If an item is not in order or defective, mark the NO column and specify the defect &/or action taken. Equipment is defective it must be tagged “Defective” and must be reported to the person responsible for the repair of the equipment. If the equipment is beyond repair it must be taken out of service. This inspection checklist relates to production related portable powered hand tools: angle grinders; drills; sanders; pedestal grinders; pedestal drills; and similar electrical powered hand tools used for construction, repair and maintenance work activities which connects with a plug to an electrical outlet socket.